Accidents can happen. Here are some tips on how to get red wine out of your carpet. Apply detergent solution (1/4 teaspoon clear hand dishwashing soap and 1 cup warm water) with a damp towel; leave on for three to five minutes (blot, don’t rub). If stain is not removed, apply a hydrogen peroxide/ammonia solution (1/2 cup of hydrogen peroxide and 1 teaspoon household ammonia) and let stand for two to three hours under a weighted sheet of plastic wrap (repeat as needed). You’ve decided on buying new carpet, but you want to shop smart. You already know how carpet is made and the difference between carpet styles, but what else is there to know before you buy? Lots. Here are some buying carpet tips to give you the upper hand on what will soon be under your feet! Unless your room is narrower than 15 feet, you’re going to have seams. Most carpet comes in widths of 12 feet and 15 feet — and on occasion, 13 feet. The degree of visibility of your seams depends on the texture and color you choose, as well as the lighting and furniture placement in your room. When you carpet your stairs, its backing may show on the bends. And if it’s a looped carpet, it can snag — especially at the seams or transitions. Check the Carpet Care section for information on how to properly care for looped carpet. A carpet’s nap runs in a single direction, making pile reversal or the shading you see from a vacuum trail, completely normal for most cut pile styles. If you’re not a fan of this, window treatments and furniture placement can minimize the effect. 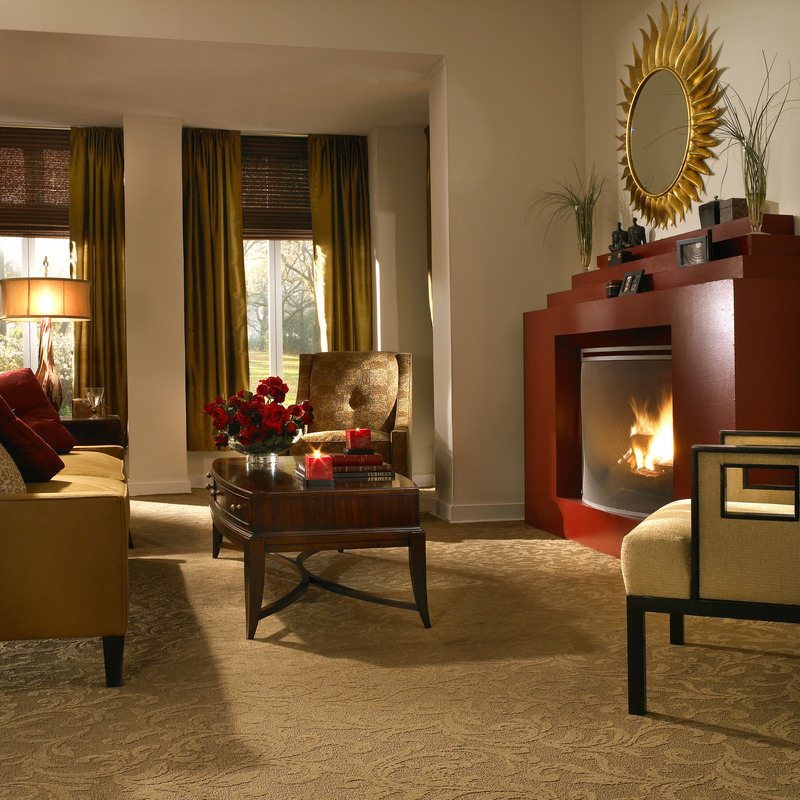 Carpet covers a large part of any room, so it’s vital that you consider some basic rules when selecting its color. First off, know that once your carpet is installed, it’s going to look lighter in color than the sample you saw in the store. Don’t ask us why, that’s just the way it is — kinda like losing a sock in the dryer. Next, recognize that color can affect the apparent size of a room. Call it a visual illusion or a trick of the light, but lighter carpet makes a room look larger and darker colors make a room look smaller and more intimate. If you like to redecorate often or plan to move soon, go neutral. It’s much easier to imagine furniture in a room that is decorated with neutral colors. It’s going to happen, no matter how long you hold out from sipping wine or munching on chips and salsa in your freshly carpeted room. Stain protection is an important consideration when buying carpet. Products come with various levels of protection and warranties. As the quality of a carpet increases, so does its stain protection level and warranty coverage. Padding or cushion is the layer of spongy material between carpet and floor. It’s the padding — not the carpet — that determines whether the carpet feels good or great under your feet. A quality padding can help preserve a carpet’s look and can extend its life and comfort by providing tougher protection against wear and tear. Padding is sold using quality specifications, not color specifications. The color of the sample you see in the store may not be the same color as what’s installed in your home. In this brief video, Johnny Loggins of Clene Start offers tips on how to get several types of spills out of your carpet.